The iFixit tear down of the Samsung Galaxy S9+ mostly revealed exactly what you were probably expecting. What you might not have known was that the specs of the battery inside the unit (3.85V, 3,500mAh and 13.48Wh) match up exactly with the battery used on the ill fated Samsung Galaxy Note 7. Now just because the specs are the same doesn't mean that the battery is the same, because it is not. It's just an interesting coincidence between Sammy's new premium handset and the twice recalled Galaxy Note 7. Exploding batteries inside the latter model forced Samsung to get the device out of consumers' hands. Considering the difficulties that the iFixit team had opening the handset, repairing the Galaxy S9+ might end up costing a pretty penny. 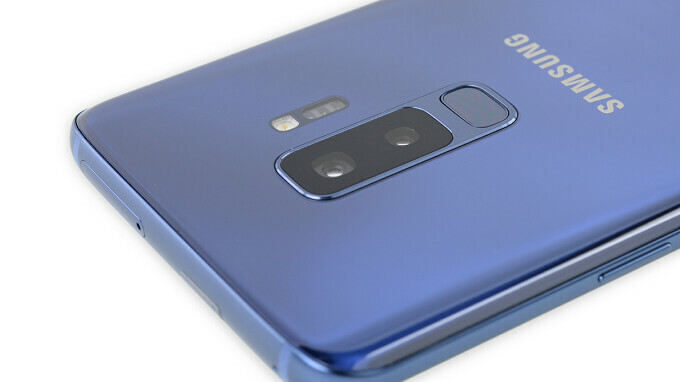 Plenty of glue was used to keep a watertight bond, and inside, the Galaxy S9+ looks quite similar to last year's model. There are changes, of course, besides a bump in specs. Even though there is a dual camera setup on back this year, the cameras are really one part with a single PCB and a single connector. Speaking of the rear cameras, the variable aperture that allows users to switch between f/1.5 and f/2.4 on one sensor, works with a couple of rotating rings that click into place when an aperture is set. According to iFixit, it might be possible to change the battery although it would be hard to do. Many components are modular and can be replaced by the owner, although to remove the display one must remove the glass rear panel while trying to fight the adhesive used to manufacture the handset. Among the chips found in the assembly were those produced by Samsung, Qualcomm, Qualcomm acquisition target NXP, Murata, Maxim, Toshiba and Skyyworks. It's the new software features I like. Physically, not too much different, software is killing it with Oreo, and Samsung experience 9.0. So many tweaks, and refinements in there. I'm with you there. I'm also digging the fact that it's got Project Treble. Should make updates faster, which is something Samsung seriously needs. Why even mention the Note 7, you completely skipped over S8+ which has the same battery and has no exploding issues to report, even when stabbed by YouTube reviewers. Because PhoneArena has to get their jobs in from time to time. Got to keep apple happy. damn Apple fans are everywhere, even when there are no mention of Apple or iPhone in the article. people will mention it in the comments. Obviously, since they r the main competitors for Galaxy S9. Also, Samsung gets mentioned in Apple articles. Lots of Samsung fans too. I wonder where those people are who are all in for removable back panel. Is this phone capable of fast phonearena trolling? I long for the days of plastic Samsung phones. While not looking flashy, they were practical and battery could be replaced easily and lasted forever. My 2013 Note 3 is still in fighting fit condition despite the innumerous falls over the years. I am afraid i cannot say the same about my Mi Max Prime which fell once and has 2 ugly dents in the metal back to show for it. Why cannot a phone be made of plastic and still look good? Why should it be an either/or type of thing? Most of us slap a case on anyway which renders the flashy and premium metal argument moot. Also aluminium is cheaper than plastic, so its literally not more premium. Plastic is not even little bit a premium material. I still have my Note 4 as a backup wifi only phone which still has a replaceable battery as well. I've already replaced 2 bad batteries that have gone bad and now on a third and it still runs ok.